Mark Erikson (left) with Phil Davies. The society visited Greenwood on Monday to play a stableford competition on the A and C nines, which were in excellent order with greens as good as golfers could remember. Again, defying low season logic, a large field turned out and the three dozen golfers were divided into two flights at fifteen and under. 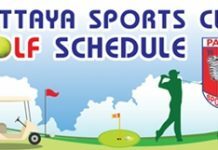 A strong breeze was evident all day and the overcast conditions meant that humidity added a club to each shot so, in effect, scores were tight and moderate. In the second flight Steve Baker’s 32 points lost out on count-back to Masaaki Sugaya’s 32 for runner-up whilst Irish golfer Chris Walsh took the flight win with 34 points. In the top flight the USA’s Tom Herrington took third with 35 points, losing on count-back to Kevin McEntee who took the runner-up place. The flight winner was another American golfer, Mark Erikson, with the day’s best points score, 38 points. Near pins were claimed by Mikko (A6) and Phil Davies (C6) whilst consolation awards went to erstwhile wig wearer Toby Glass for his best front nine of 19 points and John Pierrel’s best back nine of 20 points. A sizeable field of thirty eight starters took on C+D nines at Burapha and, as usual here, the whole course was presented in very good condition. 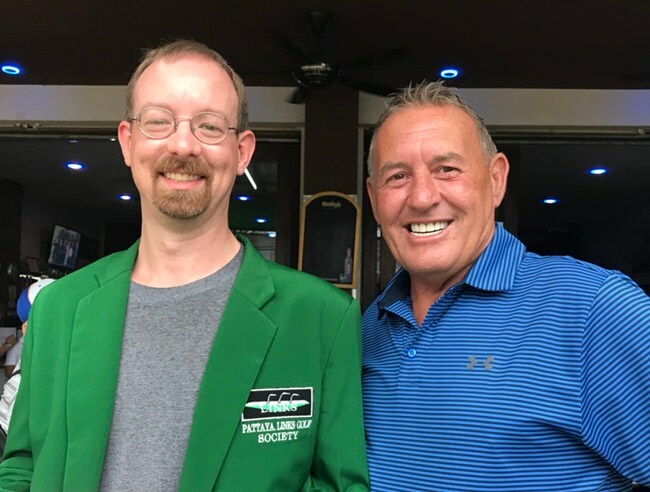 Plenty of very good scores handed in this round and two were the standouts, so a new precedent was set when Phil decided to present two green jackets. A flight saw John Pierrel return with 39 points to break his recent run of losing count-backs, a happy man at last. Colin Smith has found his real form, just before leaving for home in Wales, and 37 points looked good for second spot, but he had to win a count-back against the “other” Smith, Paul Smith, also with 37 points (73 gross), who, in turn, won another count-back to relegate Phil Davies to fourth. 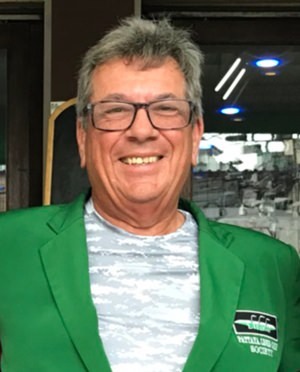 Mike Tottenham had the other 39 points to take out B flight and also get to wear the green jacket. Derek Phillips has gained the nickname with some members as “The Flash” and today he came in second, scoring 38 points. Mick Coghlan is never far from the podium and took third on 34 points, while Paul Chesney snuck into fourth on 31 points. Near pins went to Phil Davies (C5), Bob Stokes (C8), Walter Baechli (D2) and Garry Bright (D8) while consolation best nines were posted by Mark Erikson (front, 19pts) and Maurice Roberts (back, 19pts). Treasure Hill was well populated, with two other PSC Golf Societies in front of our groups, having originally booked here. The course was in good shape, although the tee boxes are still under repair so the group played from the yellow tees. Elsewhere this would ease the test but at Treasure Hill accuracy, not length is paramount of course. The greens were quite challenging with a little pace and some tough pin placements and consequently scores were modest only. In fourth place was Japanese golfer Masaaki Sugaya with 29 points, losing third place to Phil Davies on count-back. Similarly, the top two needed a count-back to decide the victor and Wayne Peppernell’s efforts on the back nine fell just a little short behind Paul Smith who took the win with 32 points and a best gross of the day of 78. Near pins went to Graeme Dunn (6), David Beames (13) and Paul Smith (17) whilst the long second hole stayed unsullied throughout. The consolation awards went to Bobby Shirkey for his best front nine of 16 points and Darren Beavers for his best back nine of 17 points.